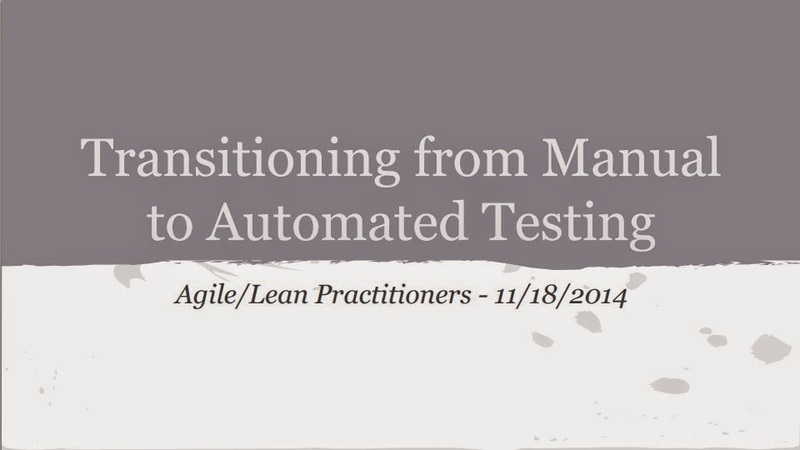 On November 18, Bill Rinko-Gay presented Transitioning from Manual Testing to Automated Testing at the Agile / Lean Practitioners Meetup. This will be a discussion where the above will be the framework but we focus on answering participants questions rather than presenting an approach. Bill Rinko-Gay has over 30 years experience in Software Development, most of that time in QA. Bill’s career and the Software QA profession progressed together until Bill realized that Agile was the demonstration that the QA profession had failed to deliver. Since 2005 Bill has been helping to re-imagine Software QA in light of Agile methods, taking advantage of the specific skills and knowledge of the QA SME and incorporating that into Agile’s self organizing teams.